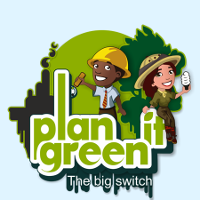 Plan It Green is an educative online game that allows you to design and create your own energy-efficient city of the future. You can design the city by building new houses, energy producers, roads etc while considering environmental and human health impacts and keeping your citizens happy. Design a city by constructing various buildings in four different categories: residential, commercial, recreation and facilities through different game levels considering scientific research, environment and health impacts and citizen happiness. Learn about practical energy savings and eco living tips on the go. Rack up points based on e.g. eco-friendliness, energy production, citizen happiness and tackle challenging quests and earn rewards for your outstanding achievement. Compete with other mayors for the highest city rating, join a circle of friends and participate in group quests. Plan It Green is a thorough city planning game that teaches children about alternative energy, complexities of building a green community and yet manages to keep the educational aspects fun and simple. Being reading-intensive, the game has a strong educational aspect with eco-friendly facts, videos and information on current events related to the environment keep popping up during the game.